On this short window of low tides for January, I made my last trip for the month yesterday to a shore at Changi. 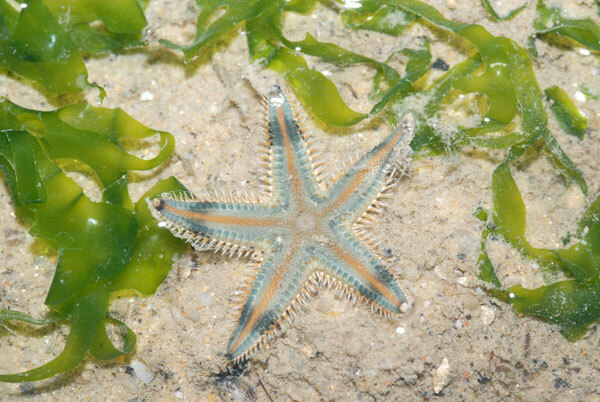 This shore is packed with human activities, from visitors to the coastal boardwalk, fishermen netting in the shallow waters to ordinary visitors digging the substrate for clams. Despite the heavy rained that happened just minutes ago, there are still many visitors to the shore. The weather changed very quickly. After the heavy shower, it drizzled for a while before the sun came out. 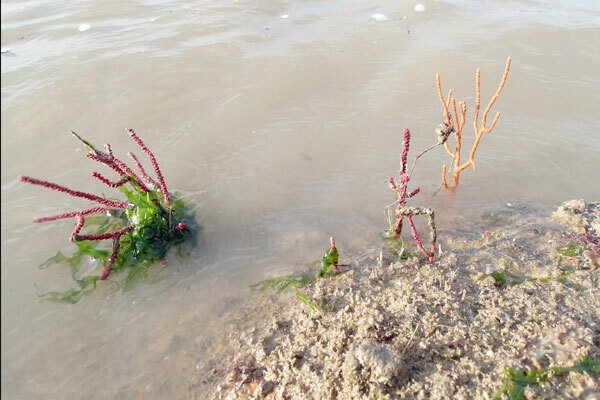 What makes this shore special is the sea fan sticking out from the shallow murky water during low tide. They come in a variety of colour and sizes. 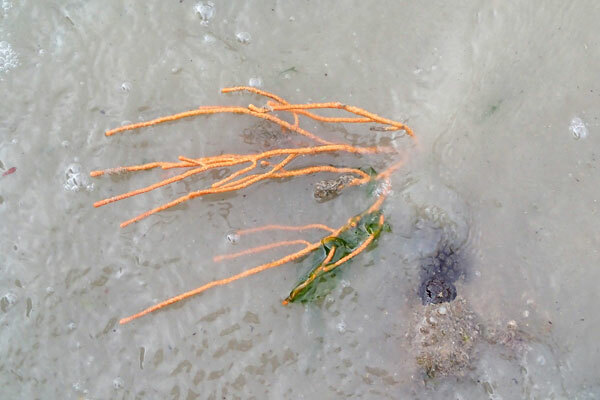 Bending orange sea fan, probably dur to its weight with low tide. Orange and red sea fans sticking out. Red sea fan covered with seaweed. 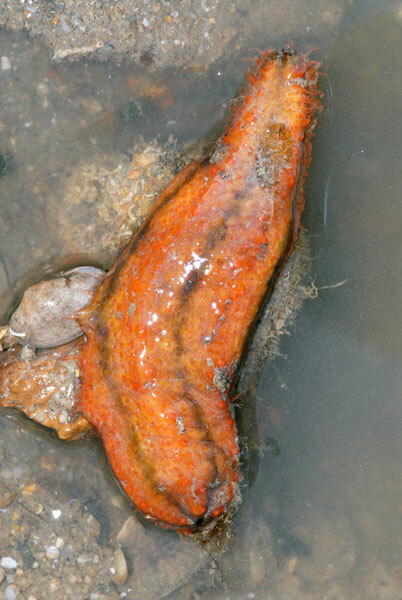 On the shore, there were many different types of sea cucumber found among the seagrass and seaweeds. 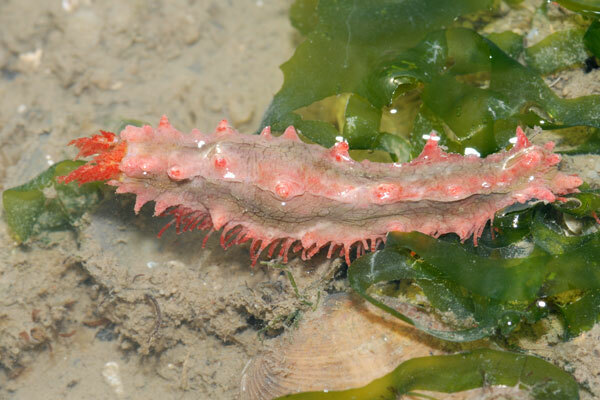 It was my first time finding a smooth sea cucumber and ball sea cucumber (Phyllophorus sp.). The large boulders near the lookout point provides a great spot to look for hiding animals. 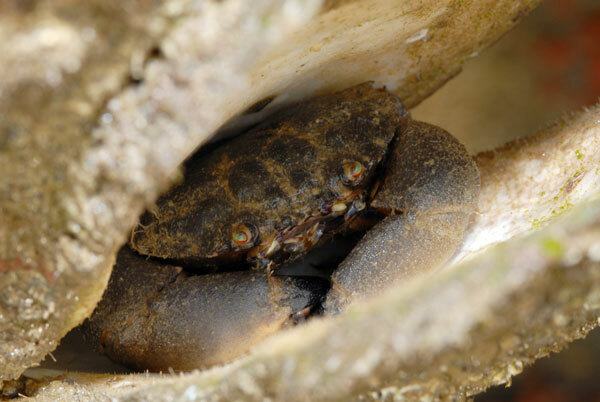 Hiding in an opened bivalve was a thunder crab (Myomenippe hardwickii). 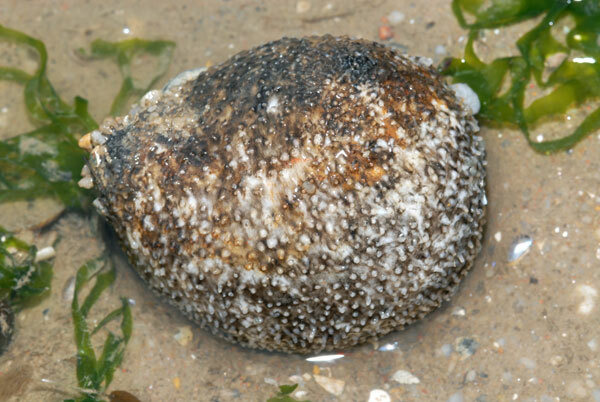 Some people refer them as stone crab. 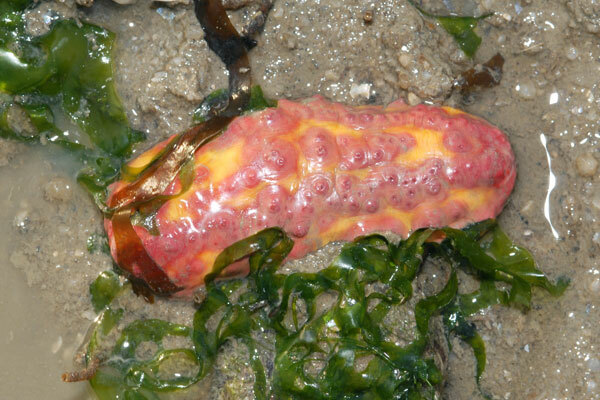 It looks very comfortable sitting inside the clam and does not seem to be in the need to move out of this space. 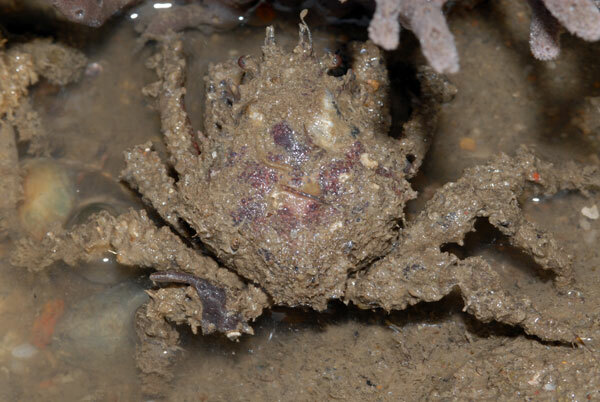 In crevices at the rock base, there are a number of medium sized spider crabs scavenging the surface for food. 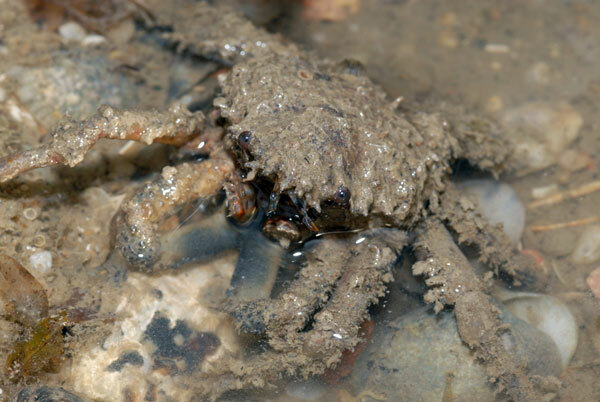 It is not easy to grab hold of the crab gently without feeling the spiky edges of its carapace. 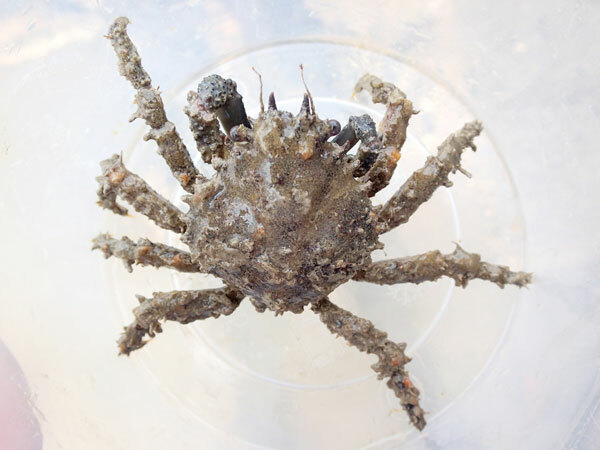 It took me some time to coax one of these well camouflaged spiky crabs into a container for a better look at them. 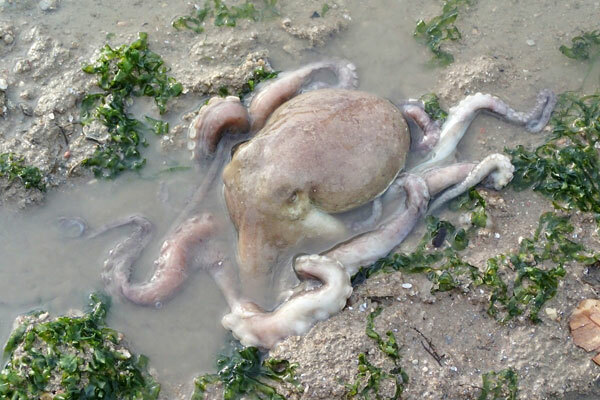 As the tide went out, a large seagrass octopus was stranded in a shallow pool. 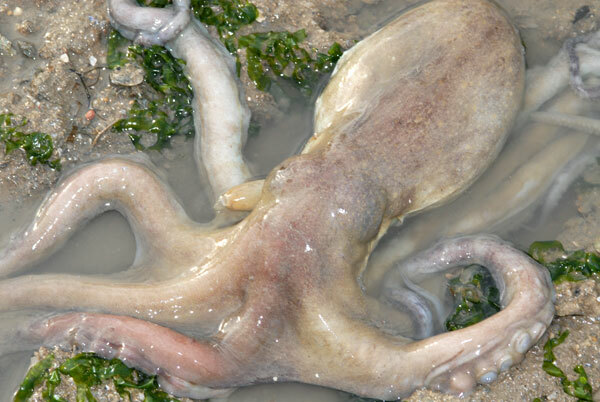 As the bite of any octopus many contain venom, it is not advisable to move any of such animals without proper equipment. 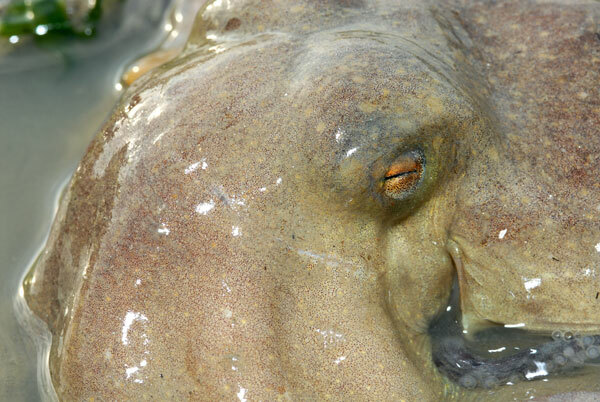 The best I could do was to help make the stranded spot deeper by shifting the substrate by the side of the octopus. The stranded octopus did attract many curious looks from the shore visitors and there were three teenage boys taking good care of it. I'm rather amazed by their actions. 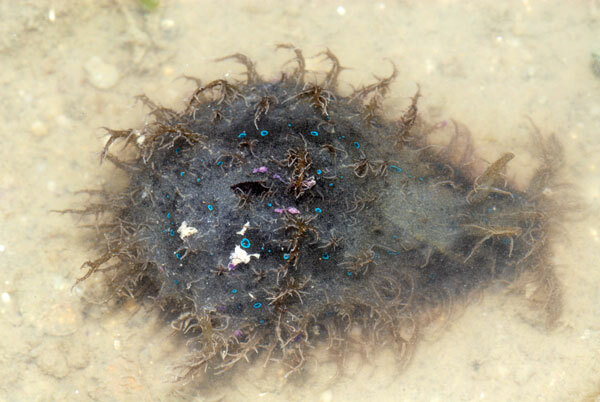 On this trip, I also saw a pair of hairy sea hare (Bursatella leachii), a plain sand star (Astropecten sp.) 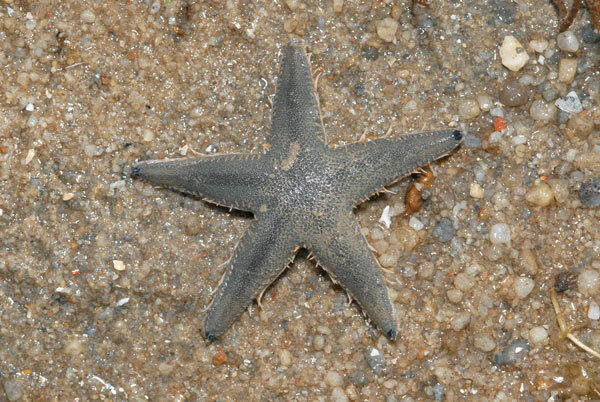 and a painted sand star. I am amazed at how small my new swimming camera can capture. 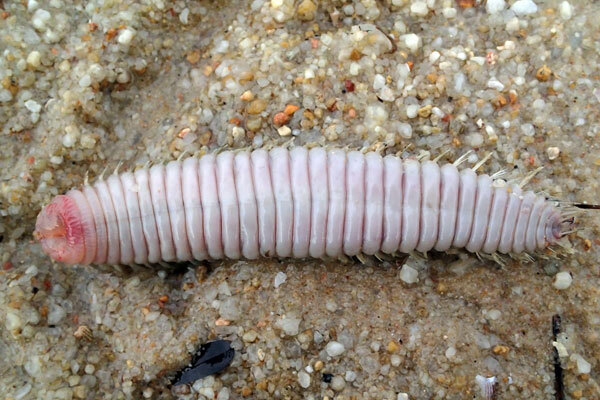 Here is an image of an isopoda. More about isopoda can be found here. 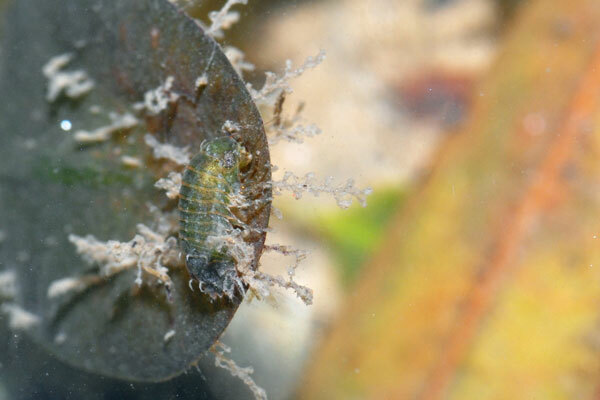 This isopod has been feeding on green food, which provides the green colouring on it. 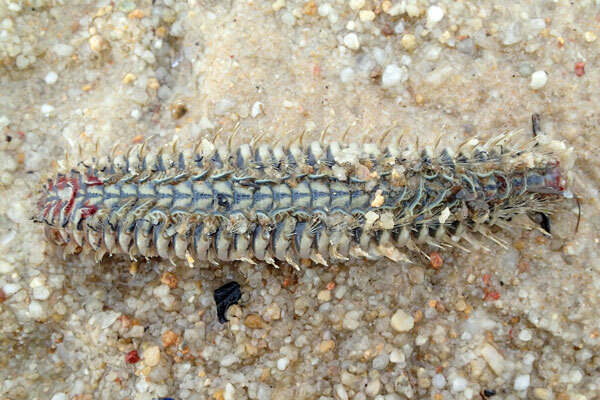 The highlight of this trip would be finding a dying looking fireworm (Chloeia sp.). 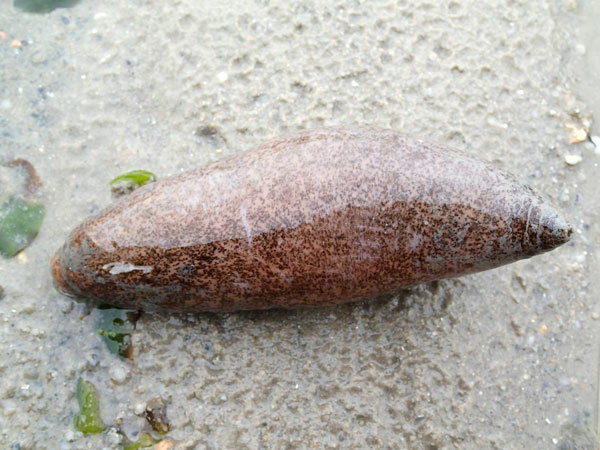 I first found it stranded on dry sand, just on the outskirts of the seaweed patch. 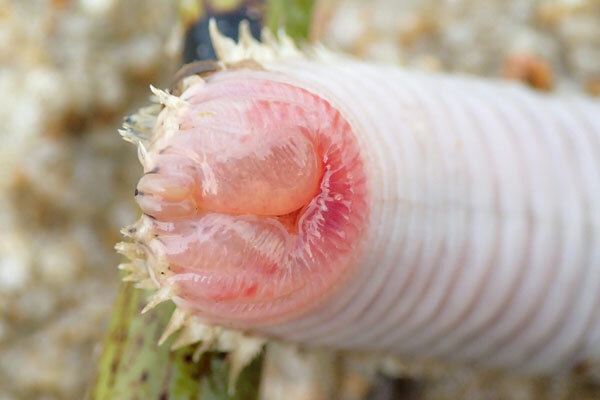 It was motionless and not responding to the touch of a mangrove propagule. 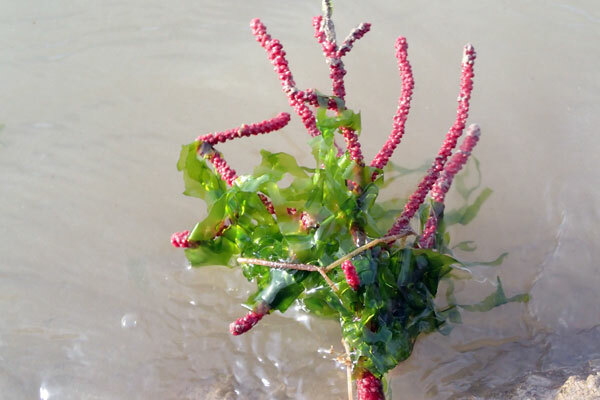 I placed it back into very shallow water near the seaweed patch and marked its location with the mangrove propagule. 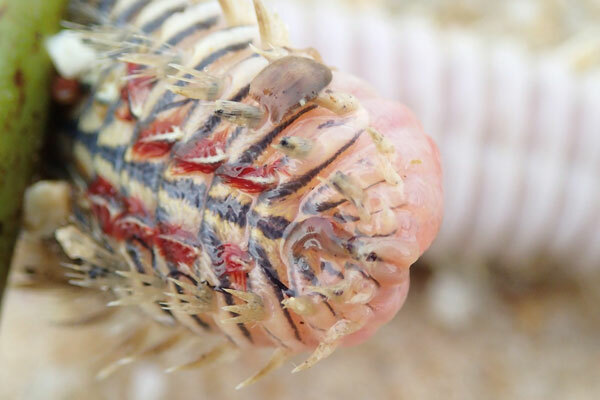 Towards the end of the trip, I came back to check on the fireworm and it was moving a little. Hope it was recovering. While the other team members saw a yellow seahorse during the trip, I helped to retrieve a seahorse caught from fishing net and released it back into the waters. The little boy who was carrying a bag of fish with the seahorse in it seemed to understand how precious the seahorse is in our waters was gladly agreed for it to released. At the same time, some education was provided to the little boy. It was a pity that I did not get to see the dugong feeding trail, which the rest of the teammates saw.